For more than 700 years, stained glass has added a colourful glow in structures around the world. From the windows of centuries-old European cathedrals to the Tiffany-coloured creations found in some of North America’s most iconic structures, stained glass has had a rich architectural history. Financial and performance constraints over the years have meant its use in modern architecture became limited until recently. Now, with advances in technology, the opportunity for coloured glass is coming back in new and exciting ways. The idea of adding hues to glass dates back to the medieval era, when coloured and painted window glass was first used in religious buildings. From that point on, stained glass has graced the windows of some of the world’s most architecturally and culturally significant buildings. Fast forward to the late 20th and early 21st centuries, in an era where each building component is being developed for maximum performance. Stained glass has been tainted with a reputation for being impractical and out of sync with high-performing building materials. Today, glass is at its best when it is low in maintenance and can perform economically against harsh elements. The lead panes dividing each coloured segment and the structural weakness of the stained glass method often exclude it from the blueprints of modern, environmentally conscious building plans. Although stained glass has become infrequent in its use, the desire to infuse colour into architecture remains. Enter laminated glass with pigmented interlayers. Laminated glass consists of two glass layers bonded together by a thin, flexible, plastic interlayer under heat and pressure. The resulting piece looks like traditional glass, but has incredible strength. It can be used in place of regular glass in nearly any architectural application, from curtain walls and exterior windows or overhead glazing to interior partitions and decorative elements. In addition to its many performance benefits, the introduction of an interlayer also offers tremendous esthetic benefits, including custom hues. By sandwiching up to four pigmented interlayers, it is possible to achieve more than 3000 transparent or translucent glass colours. This provides pure colour and transparency (or varying degrees of translucency) that is durable and easy to maintain and install. When interlayers use highly resilient pigments (as opposed to ink-based colourant), the true colour lasts for years, even when exposed to direct sunlight. Unlike stained glass, coloured glass flows without interruptions or divisions in the design. The fluidity of entire walls made of coloured glass creates an esthetic that can enhance a building’s design, not clash with its modern façade. Introduced nearly 20 years ago, the pigmented interlayer system for laminated glass has been soaring in popularity in recent years. The sheer number of contemporary buildings around the world that glow with colour testify this system brings the medieval glass-making tradition up to speed with current glazing technology. Use of colour in laminated glass applications is thriving. While Europe has historically been the largest market for this type of laminated glass, architectural design trends across Asia Pacific and the Americas demonstrate tremendous growth in the use of high-performance colour glazing technology over the past two years. In the Asia Pacific region, demand for pigmented interlayer systems grew 13 per cent from 2009 to 2010, and 29 per cent from 2010 to 2011. In South America, demand for pigmented interlayer systems grew by 42 per cent from 2009 to 2010 and another 30 per cent from 2010 to 2011. North American demand was more modest, growing four per cent from 2009 to 2010. However, specification leapt forward by 23 per cent from 2010 to 2011. Global attention to coloured glass has resulted in applications reflecting each region’s culture, approach to design, and style that makes a statement. Working with an entirely new colour palate, designers are rethinking the power of colour in buildings and how interlayer technology can illuminate new design possibilities. 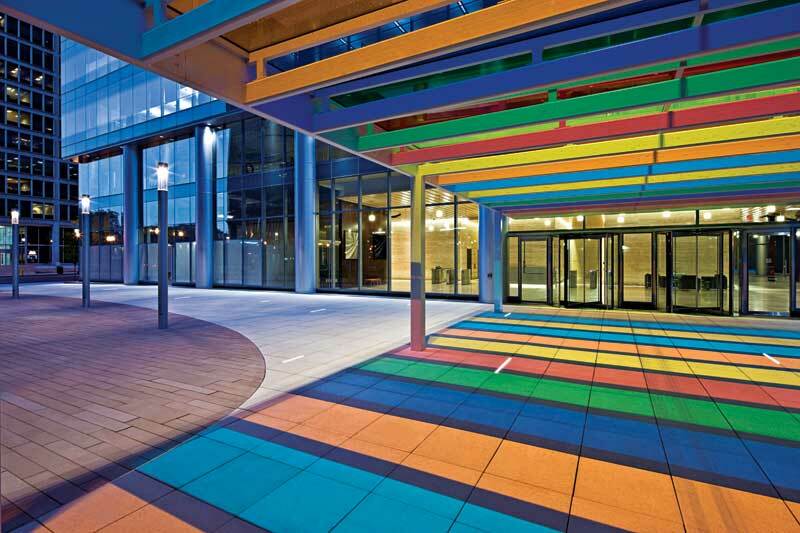 Architects and designers continue to push the envelope, developing innovative colour design methods for glazing applications that can provide solutions to many architectural design challenges. Custom interlayers can produce a broad spectrum of hues and moods unachievable using glass stock selection. Nothing adds interest to an interior like colour. Perhaps among one of the most famous uses of coloured glass and architecture in recent years is Brunete Fraccaroli’s Japanese barbeque restaurant in Sao Paulo, Brazil. As a designer who specializes in hospitality environments, Fraccaroli often implements graduated-film-laminated inside glass to bring dimension out of a flat plane. In this project, slanted glass is supported by sloping beams clad in purple polyvinyl butyral (PVB)-laminated reflecting mirrors, which are integrated into the same plane as the glass.